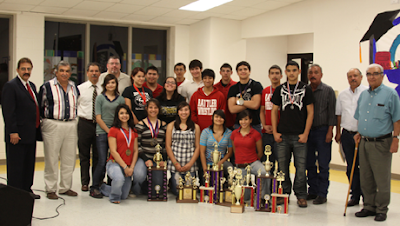 The Rio Grande City CISD Board of Trustees commended the Rio Grande City High School Wrestling Team for having won the district championship and qualifying for state competition. Mr. Ronald Pratt (Wrestling Coach) is very proud of all of the students and congratulated them for all of their hard work. "Passion, dedication, and desire have taken the students to this level," said Pratt. Mr. Basilio Villarreal, Jr. (RGCCISD Board President) congratulated the students on behalf of RGCCISD and the whole community. "You have put Starr county on the map and we are extremely proud," he said. (Pictured with the students is Mr. Roel A. Gonzalez-Superintendent, Coach R. Pratt, RGCCISD Board President Mr. Basilio Villarreal, Jr., Board Members-Mr. Cesar Gonzalez, Mr. Ruben Klein, Mr. Noe R. Gonzalez and Mr. Francisco "Paco" Zarate.) RGCCISD Photo.